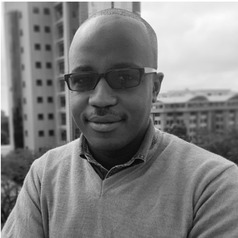 Paul Ouma is a PhD candidate of epidemiology at the Open University UK, supported by the Initiative to Develop Research Leaders (IDeAL), based at the Kenya Medical Research Institute Wellcome trust Research Programme (KWTRP). His research focuses on defining population level access to emergency hospital care in sub-Saharan Africa. Prior to starting the PhD in 2016, Paul was part of the spatial health metrics group within the KWTRP, where he worked on mapping populations at risk of malaria, coverage of malaria interventions and access to health services. He holds a Bachelor’s degree in Geomatic engineering from the Jomo Kenyatta University of Agriculture and Technology, a Master’s degree in Geographic Information Systems from the same university and a postgraduate diploma in health research methods from the Pwani University. His interests are in spatial epidemiology, emergency care systems and accessibility to healthcare in Africa.